If it isn't, it may be on the Desktop, or you may not have it. It's on your Windows CD, or you can get it at http://windowsupdate.microsoft.com. If you use Windows XP, it's on the Start menu. Click the 'Add' button at the top right-hand side, and select 'Mail'. If appearances are important, pay attention to Capitalization, spelling, etc. 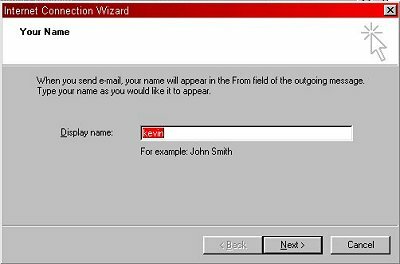 No error checking is done, and this has no effect on the operation of your e-mail account. 5. This is where you enter your e-mail address. Enter it exactly as it was given to you; it is probably case sensitive. 6. 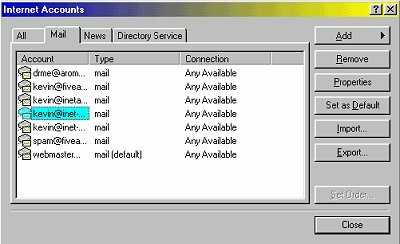 Your incoming mail server is probably a POP3 server. 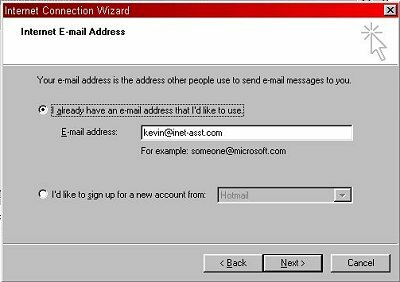 You may also have an IMAP option; you can come back later and set up this same e-mail account to use IMAP. Your Incoming mail server and your Outgoing mail server are probably the same as your domain. If not, your ISP would have specified otherwise. Note that you don't include the @ sign, www. or anything else. 7. Enter your account name here. If your domain name shares computer space with other domain names, your account name may not be the same as your login name. 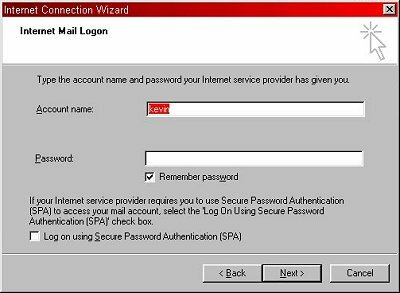 Keep in mind that if you check the 'Remember password' box, anyone with access to your computer can send and receive e-mail in your name. Don't check the SPA box at the bottom unless you've been told you have to. And the next window is your last chance to cancel, go back to your cabin in the woods and work on your Manifesto. If you're happy with everything, click 'Finish'. After clicking 'Finish', you'll be back at this screen. Double-click your new e-mail account name, or single-click to select and push the 'Properties' button. 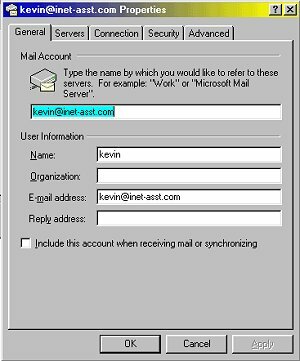 Unlike Outlook Express 4.x, you set the account name that you use in the top box (highlighted in light blue). By default, the domain name in used. What you put in has no effect on the functionality of your e-mail account. 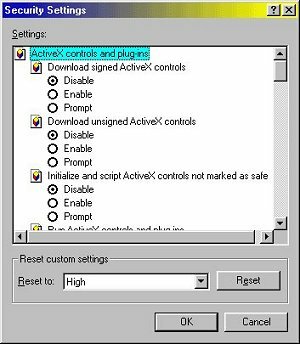 Most of the other options are what you entered in the initial setup of this account, and don't need to be changed unless your account doesn't work. 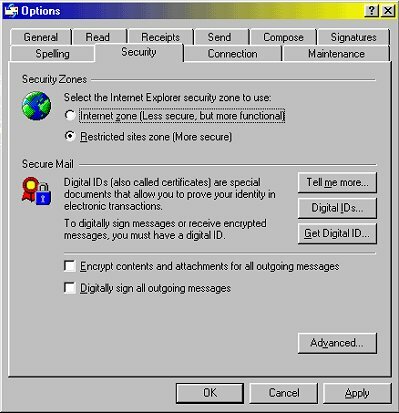 E-mail readers that use the 'Preview' feature (such as Outlook Express) should be put in the 'Restricted Sites' zone to prevent malicious scripts (and viruses) from running. 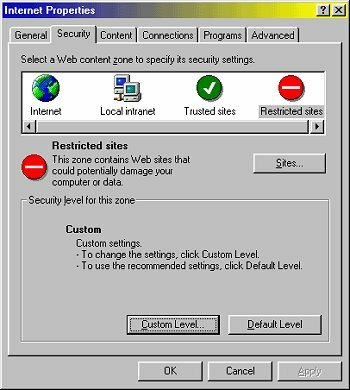 Go to the 'Tools' menu, then click 'Options', then the 'Security' tab. There are many useful items buried on these tabs. Take the time to go over them at least once. Many people (such as AOL members) use e-mail readers that can't see e-mail composed in HTML. Click the 'Send' tab and select 'Plain Text' to avoid sending HTML tags in your e-mail. Don't worry about mistakes here. The 'Reset' button will put everything back the way it was. If you've ever wondered about cookies, this is the place to manage them. Despite what everyone (especially Microsoft) has been trying to tell us, cookies are unsafe and should be controlled. You can look around at //www.cert.org for details. 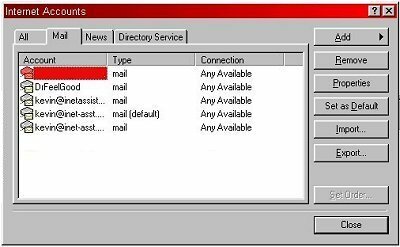 If you ever have trouble of any kind with your e-mail account, ask your system administrator. Even if he uses the same e-mail system, his account probably works flawlessly at all times, and he won't know or care how yours is doing unless you tell him. 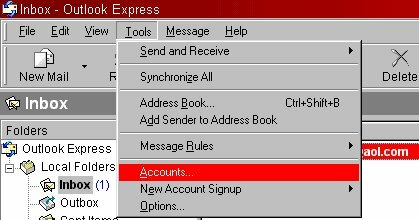 Internet e-mail delivery systems and the POP and/or IMAP server you use are two separate systems. In most cases you aren't losing any mail if it seems to not be working, but you won't know for sure unless you ask. You can check your e-mail server status yourself and look like a geek at the same time. Click the Start button, then Run, and type telnet . Click 'Connect' , then 'Remote System'. 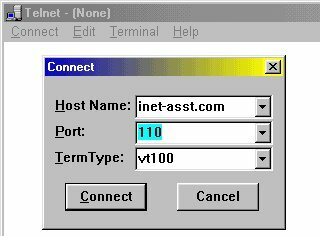 'Host Name' is your e-mail account domain; port 110 checks the POP e-mail server. You should get a terse welcome message if all is well. If the system is down, you'll get a 'Could not connect to...' alert box. 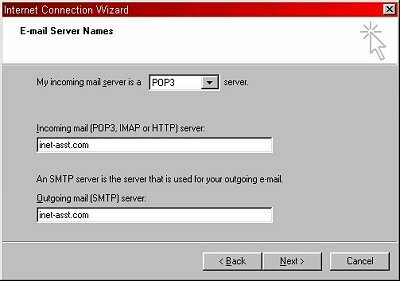 Check the same way on Port 25 for SMTP (internet mail between servers). If either system is down, the mail is down. If you get a 'Could not connect to...' alert, contact your system administrator.